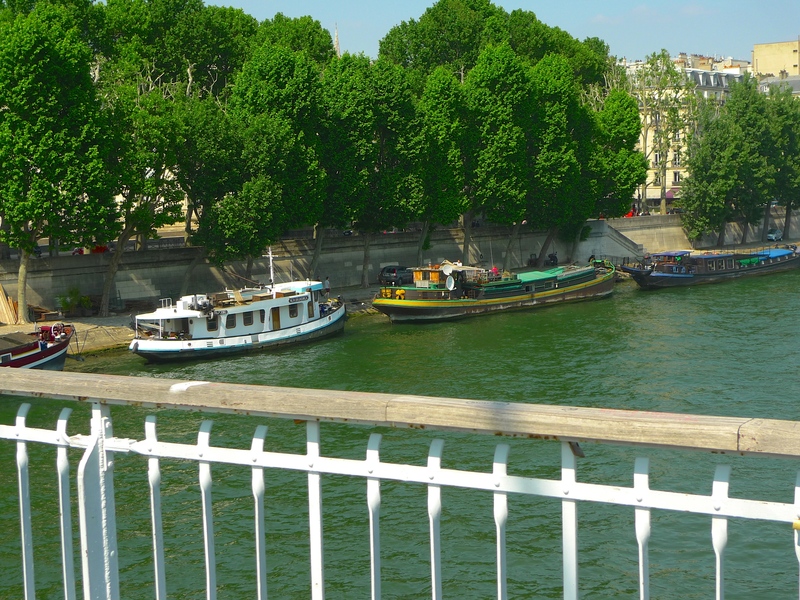 FURTHER RESEARCH FOR my Paris Bridges Project took me to the Passerelle Debilly, a stone’s throw from the Tour Eiffel and one of the four “passerelles piétonnières”, or footbridges, to cross la Seine within the Paris city limits. Like some of the other bridges in this part of Paris, the Paserelle Debilly owes its existence to one of the great Expositions Universelles, or World’s Fairs, held on and around the Champs de Mars in the late nineteenth-century. 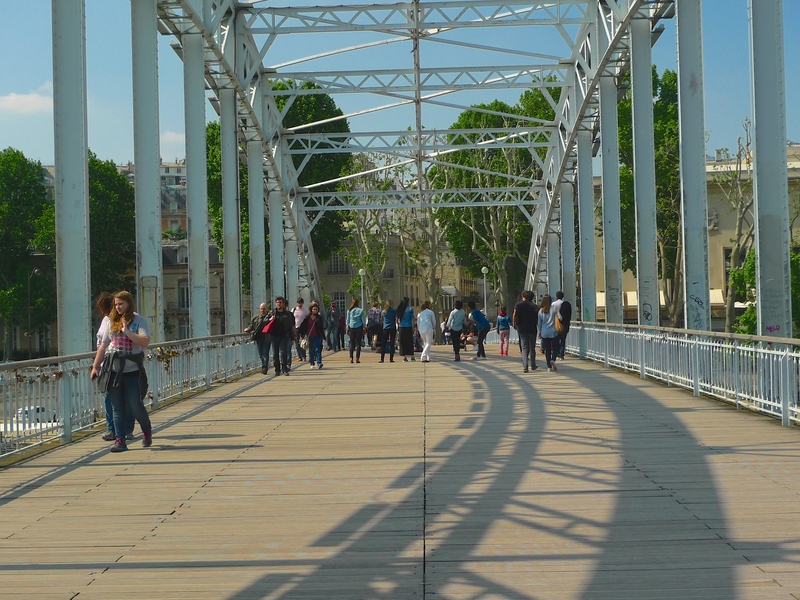 Built as a footbridge for the 1900 Exposition Universelle, the Passerelle Debilly was originally positioned to connect the Army and the Navy exhibition halls on one side of the river with the Old Paris halls on the other. 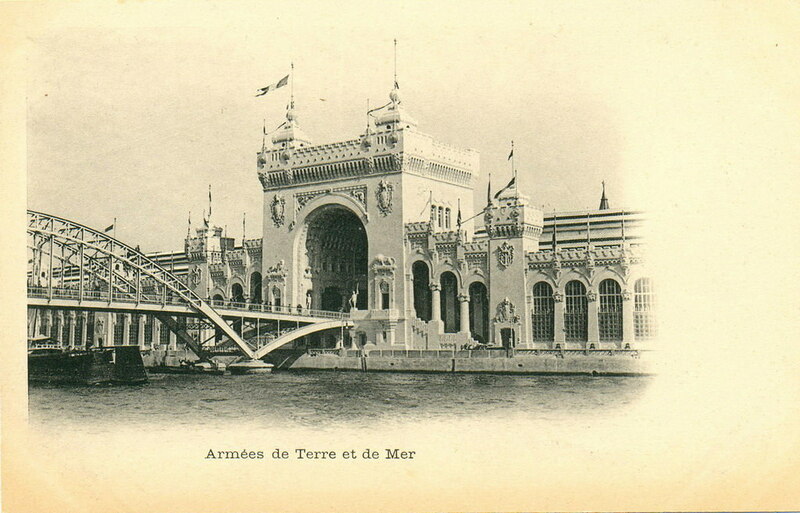 Exposition Universelle 1900 – Passerelle Debilly and the Armées de Terre et de Mer Exhibition Hall. The Passerelle Debilly was designed by three French engineers Jean Résal, Amédée Alby and André-Louis Lion. Jean Résal held the position of Ingénieur en chef des ponts et chausses, a prestigious civil engineering post dating back to the seventeenth-century and an especially important post during the late nineteenth-century redevelopment of Paris. Résal was a pioneer of building metallic bridges in the late nineteenth-century and his work includes as well as the Passerelle Debilly, the Pont Mirabeau, the Pont de Bercy, the Pont Notre-Dame and the magnificent Pont Alexandre III. The construction work for the Passerelle Debilly was undertaken by the firm of Daydé et Pillé, specialists in metallic construction who also constructed several other bridges in Paris. 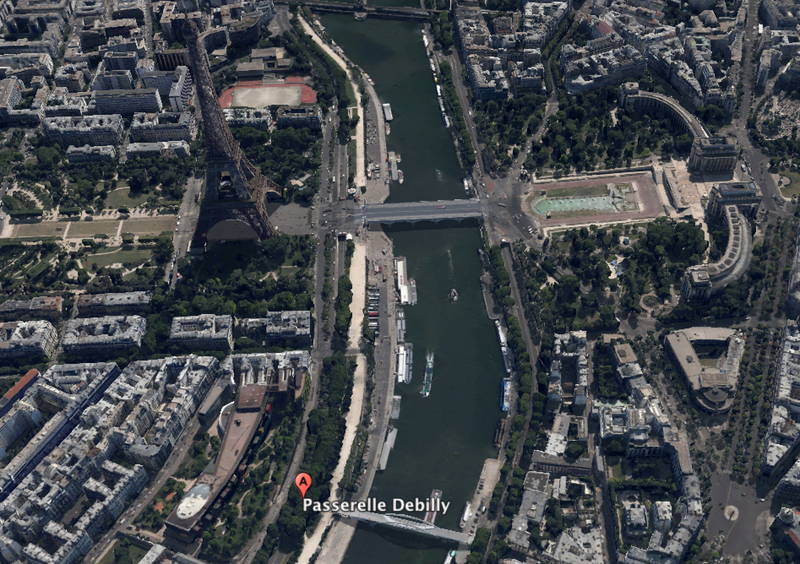 The construction work was completed and the Passerelle Debilly was opened on 13th April 1900. 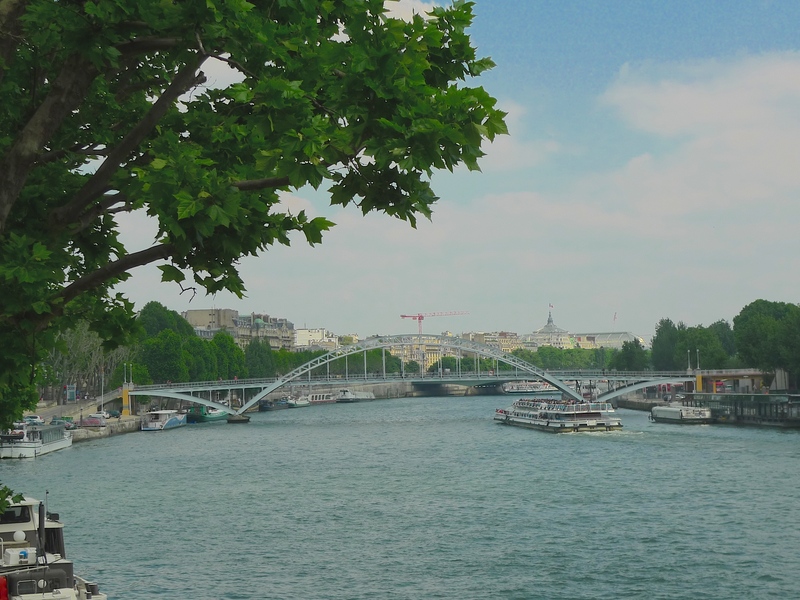 To begin with the name of the footbridge was ambiguous, it was called both the Passerelle de l’Exposition Militaire and the Passerelle de Magdebourg. It was only later that it was formally designated as the Passerelle Debilly, after General Jean Louis Debilly who was killed in the Battle of Jena (La bataille d’Iéna in French) in 1806. 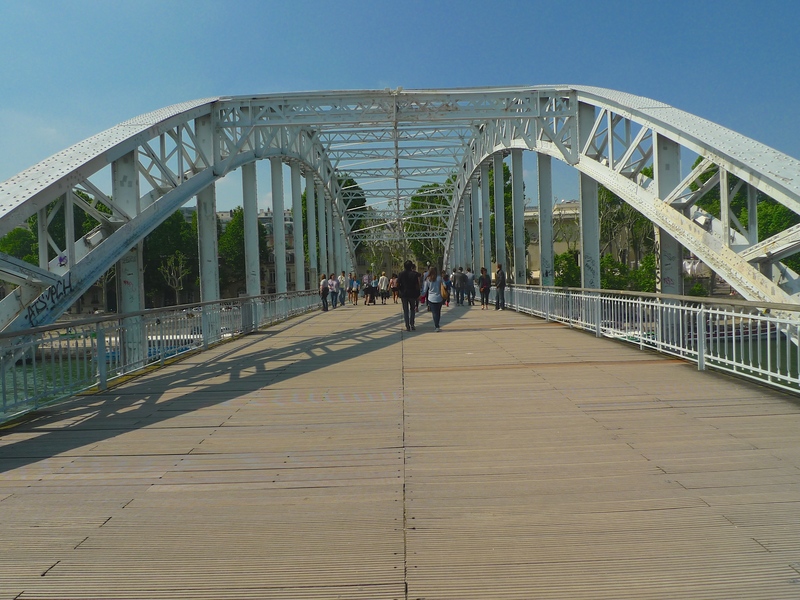 The bridge of course was designed as a temporary structure to serve visitors to the 1900 Exposition Universelle. But in 1903, after the Exposition had been deconstructed, the bridge was taken over by the City of Paris and it became a permanent fixture but not before it was moved some two hundred metres upstream opposite the rue de la Manutention, closer to the Pont d’Alma and further away from the Pont d’Iena, the bridge named after the battle in which Jean Louis Debilly died. The Passerelle Debilly we see today is the original bridge save for several new coats of paint and the addition of the tropical hardwood walkway. It’s 120 metres long and 8 metres wide and it stretches from the Quai de New York on the Right Bank to the Quai Branly on the Left Bank. The bridge comprises three spans anchored on stone piers with the central span forming an arch with an intermediate deck of 75 metres and two half-arch end spans of 22.50 metres. 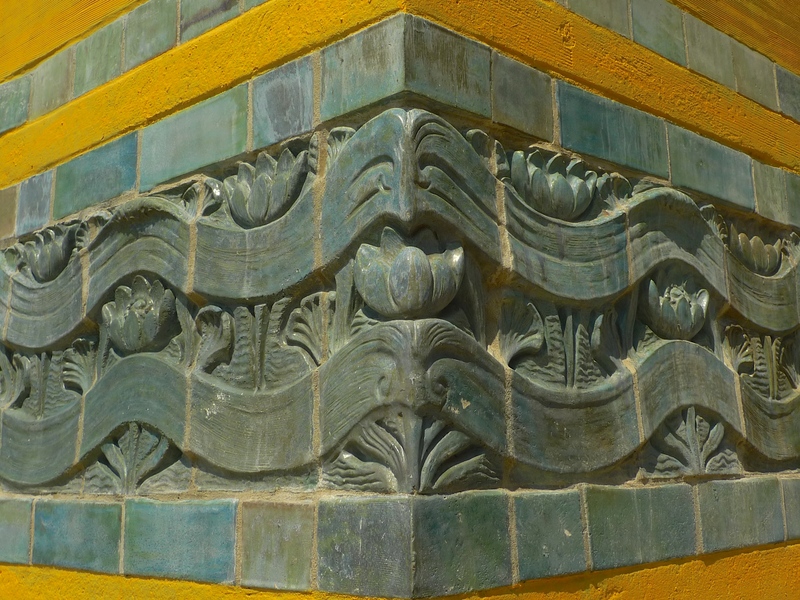 At either end of the Passerelle Debilly are columns decorated with dark green ceramic tiles giving the impression of waves made by the French ceramic company, Gentil et Bourdet. Having successfully survived its temporary status after the 1900 Exposition Universelle, the Passerelle Debilly came under threat again in 1941 when the Président of the Architectural Society no less characterised it as an “accessoire oublié d’une fête passée”, a forgotten accessory of a past event. 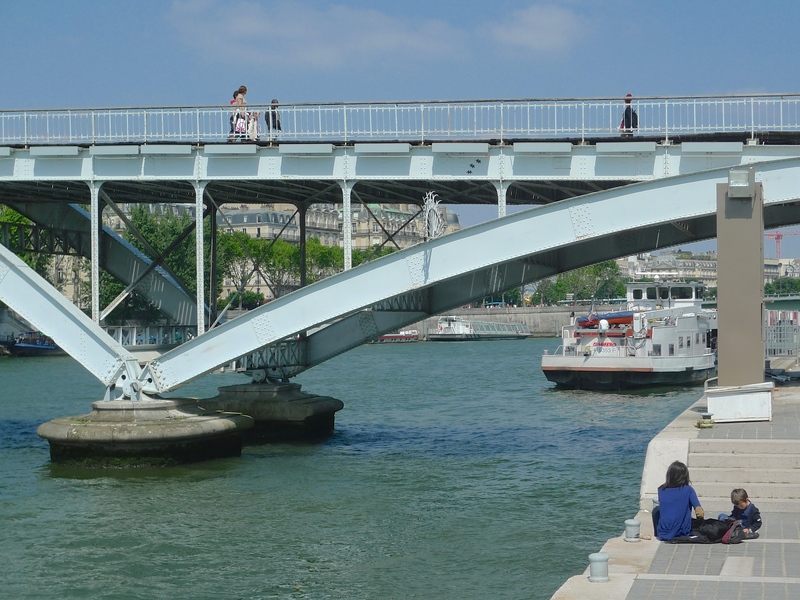 But the Passerelle Debilly snubbed its nose at this intervention and survived to become listed in the supplementary registry of historical monuments in 1966. 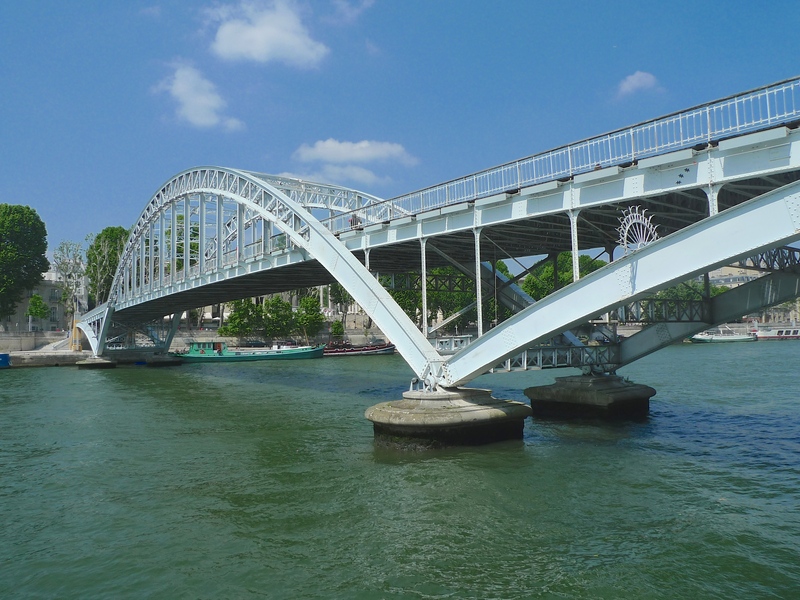 Regular readers will know that I have embarked upon a Paris Bridges Project; a project to explore all the thirty-seven bridges that cross la Seine within the Paris city limits. My exploration includes not only researching the history of each bridge but also seeking out the characteristic sounds of each bridge. 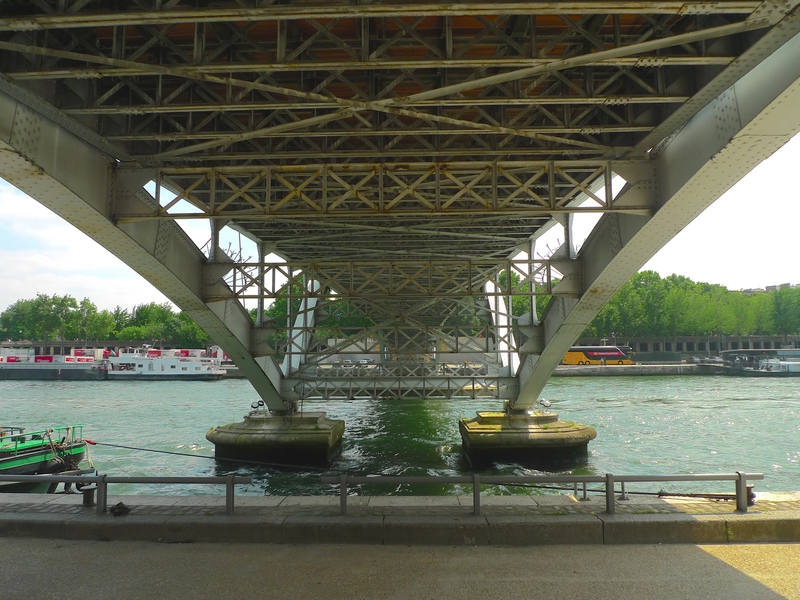 On my visit to the Passerelle Debilly I began by recording the sounds under the bridge on the Quai de New York side. 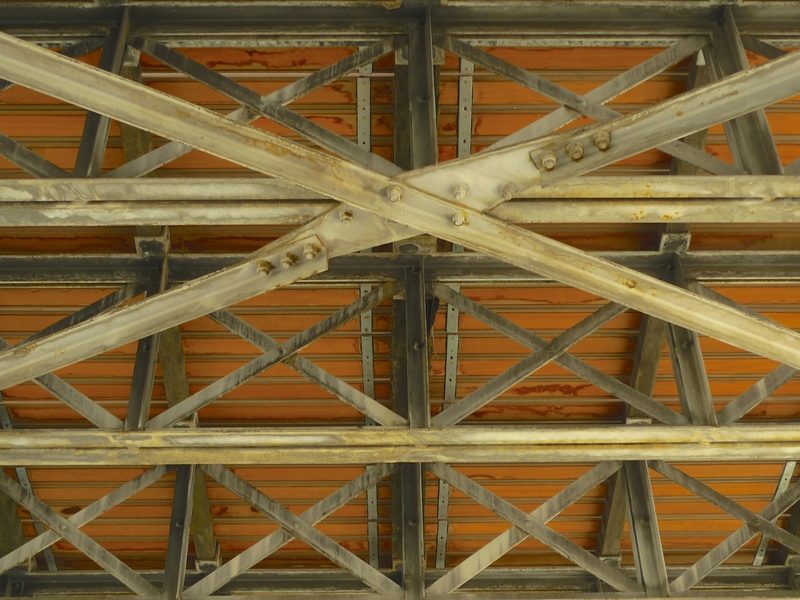 I sat on a metal rail, as far under the bridge as I could get, with the metal frame of the bridge and the wooden walkway above my head and began to record. The sounds of boats passing each leaving their sonic footprint in the form of waves lapping on the edge of the quay, a boat moored to my left creaking as if held prisoner and crying out for some means of escape, a sonic glimpse of a tourist guide over the public address system on a passing tourist boat, the testosterone-fuelled sounds of a passing motor-cycle, half-heard conversations of teenagers, and the occasional, almost imperceptible, footsteps echoing from the tropical hardwood floor of the bridge above seemed to be the characteristic sounds from under the Passerelle Debilly. 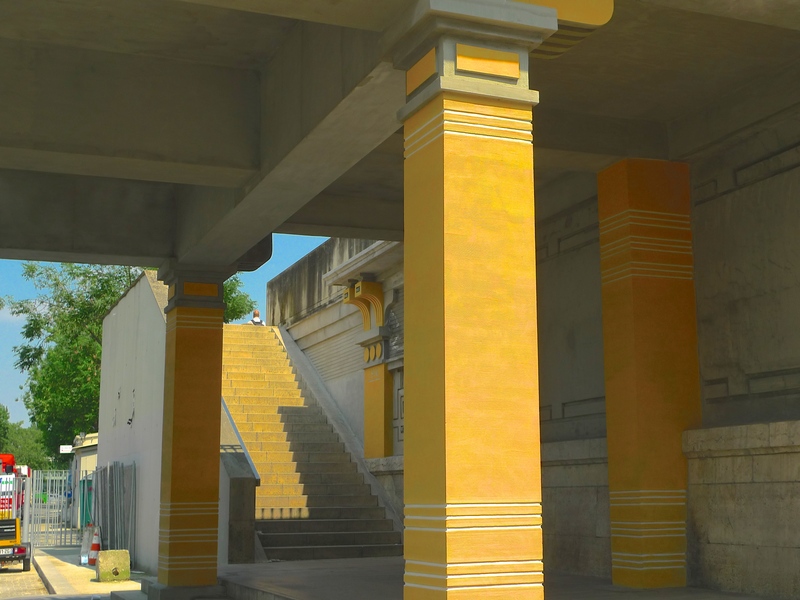 But the characteristic sounds of any place are as varied as the places you listen from and so I decided to venture up onto the bridge to see what I could find. Standing on the bridge, I set up my microphones on the downstream side of the bridge pointing upstream across the broad swathe of tropical hardwood lining the floor of the bridge, something those walking across the bridge in 1900 would not have found. From this position I was able to record everyday life passing by. I found three distinctive sets of sounds on the bridge. Not surprisingly, the sounds of footsteps on the wooden floor on the bridge were much clearer than the muffled sounds of footsteps I’d heard earlier from under it. It was interesting to observe the variety of shoes that passed by, not something I would usually take an interest in, but I became quite expert in recognising which shoes would make an interesting sound and which would not. The repetitive sounds of tourist boats passing underneath the bridge were ever present of course but it was the snatches of half-heard conversations in a variety of languages that I found really fascinating. Who were these people, what had brought them to this place and what stories had they to tell? One distinctive sound that I might have expected was conspicuous by its absence – the sound of vehicular traffic. Save for the inevitable screeching motorcycle in the distance, from the centre of the bridge the sound of traffic was almost imperceptible – a rare thing in Paris. While the sounds of vehicular traffic were pretty much absent from the centre of the bridge, the sounds of the river traffic were certainly present. I’d heard the sounds of the boats passing from under the bridge and from on the bridge but, since there was so much river traffic at the time I was there and since the sounds of the boats filled the air, I thought I would try to listen to them from a different perspective. I changed my microphones for a pair of tiny lavalier microphones, the same as TV newsreaders wear, which I lowered down from the edge of the bridge so that they were hanging midway between the bridge and the water. From this perspective I still caught some of the sounds emanating from on the bridge (the microphones were omni-directional) but I was able to capture the sounds of the boats passing underneath with a clarity that would not have been possible from on the bridge. Listening through my headphones I heard snatches of conversation from on the boats often before the boats had actually emerged from under the bridge and most surprisingly, I heard the sound of music from a boat berthed on the Quai Branly which was quite inaudible from my previous recording position on the bridge. One of the things I’m trying to do in my Paris Bridges Project is to not only discover the characteristic sounds of each bridge but also to try to seek out the sounds that might be unique to each bridge. Finding the unique sounds can be quite a challenge because the sounds are often not immediately obvious and sometimes they can be almost imperceptible to the casual listener. 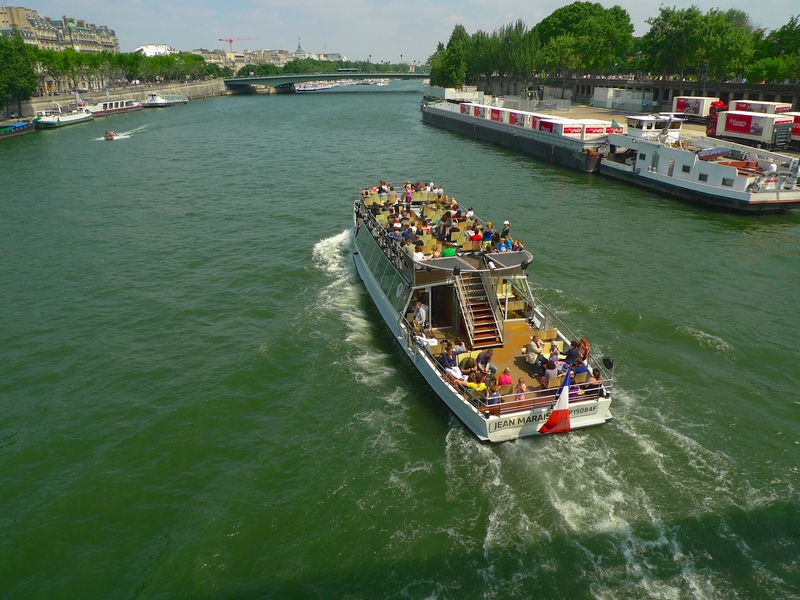 At the Quai Branly side of the Passerelle Debilly is the Port de la Bourdonnais, a place where some of the large restaurant boats that ply la Seine are berthed. The bridge runs over the top of the port with steps leading down to the quay. Under the bridge, beyond the steps, is a wall behind which run two railway lines of RER Line ‘C’. It seemed to me that the sounds of an RER railway line running under the Passerelle Debilly could be the unique sounds of the bridge that I was looking for so I stood under the bridge, listening and waiting. Presently, I heard the very faint sounds of a train passing behind the wall, sounds too faint to capture without the aid of contact microphones (microphones designed to pick up sounds from solid objects) but the sounds were definitely there. Since I wanted to capture these sounds but I didn’t have my contact microphones with me I resorted to ‘Plan B’. 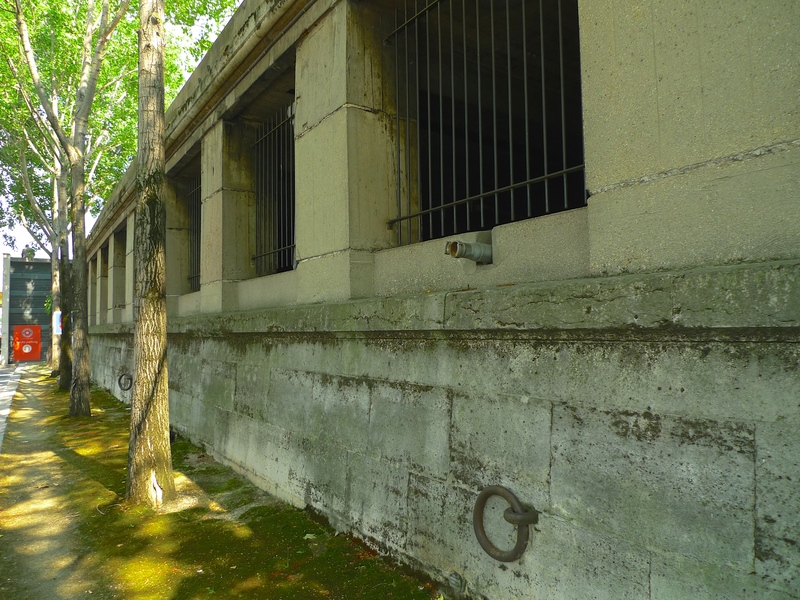 From where I was standing, the rail lines were completely hidden from view but a few steps further along the Port de la Bourdonnais metal grills appear in the wall. I approached one of the metal grills and discovered that it was just, but only just, high enough for me to reach and so with the dexterity of a cat burglar I managed to get my tiny lavalier microphones through the grill and lower them down the other side. I waited to see what would happen. Standing at the end of two wires protruding from a hole in the wall attracted more attention from the passing tourists than I’d bargained for but I pressed on regardless and I was pleased with the results. I was struck by the near silence in the tunnel between the trains despite the everyday sounds around me on the outside of the wall. The only time this silence was disturbed was when a very large tourist bus passed behind me, rather too close I thought. For me at least, these were the unique sounds of the Passerelle Debilly. 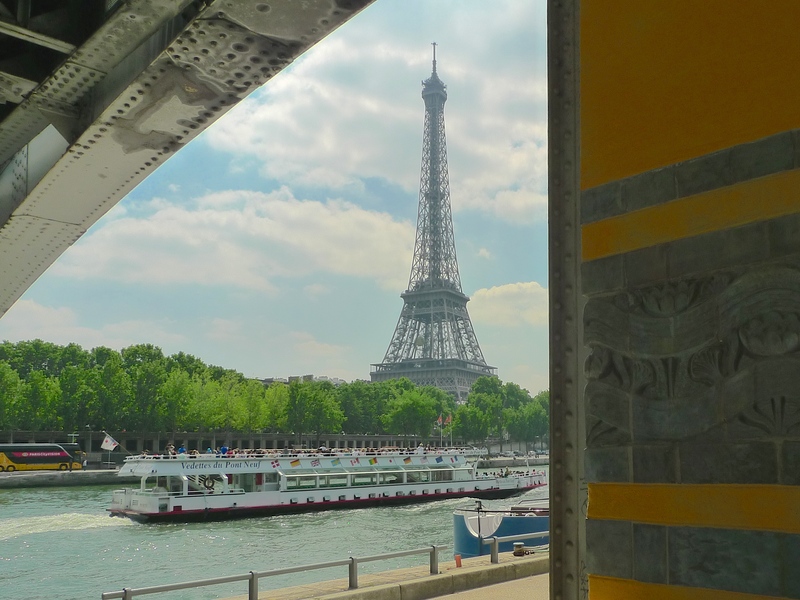 Located as it is close to the Tour Eiffel and the site of the 1900 Exposition Universelle, the Passerelle Debilly is well used to hosting visitors. In 1900 visitors came to witness the latest in architecture, machines and inventions including such things as the new Art Nouveau, the Grande Roue de Paris Ferris wheel, Russian nesting dolls, diesel engines, talking films, escalators, and the telegraphone, the first magnetic audio recorder. 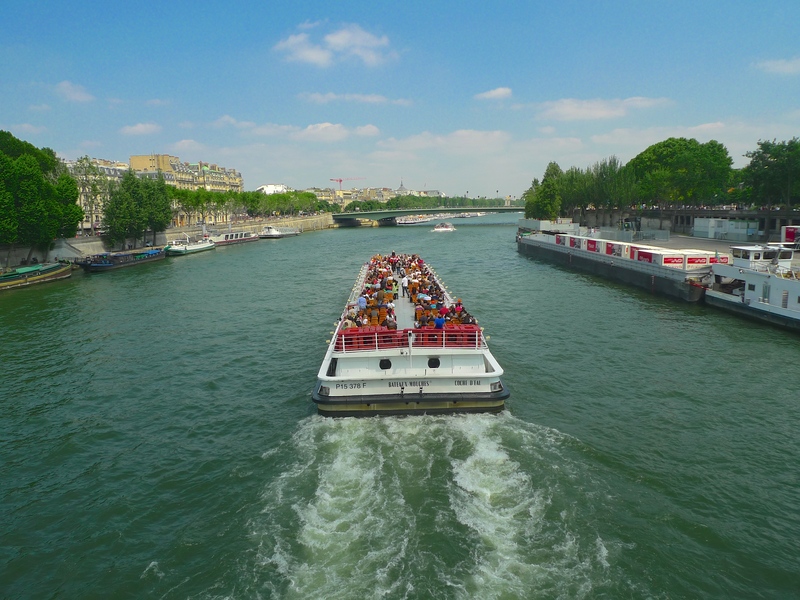 Today, visitors still come to experience what Paris has to offer and a good number of the visitors, now as then, will pass over the Passerelle Debilly. But there was a time when the Passerelle Debilly was more than just a passing attraction for tourists. For those of us of a certain age and for whom memories of the Cold War are still vivid, the Passerelle Debilly, when viewed from a certain angle and in a certain light, has a rather sinister look to it. 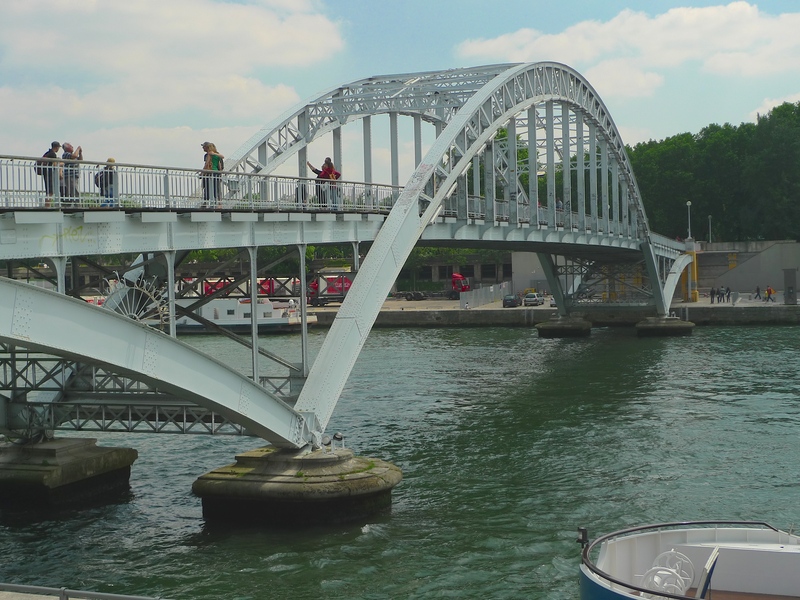 It’s perhaps not surprising then to discover that the Passerelle Debilly was a meeting place for spies and particularly secret agents of the former East Germany. In 1989, a German diplomat working for the Secret Service of the Democratic Republic of Germany was found dead on this footbridge several days after the fall of the Berlin Wall. 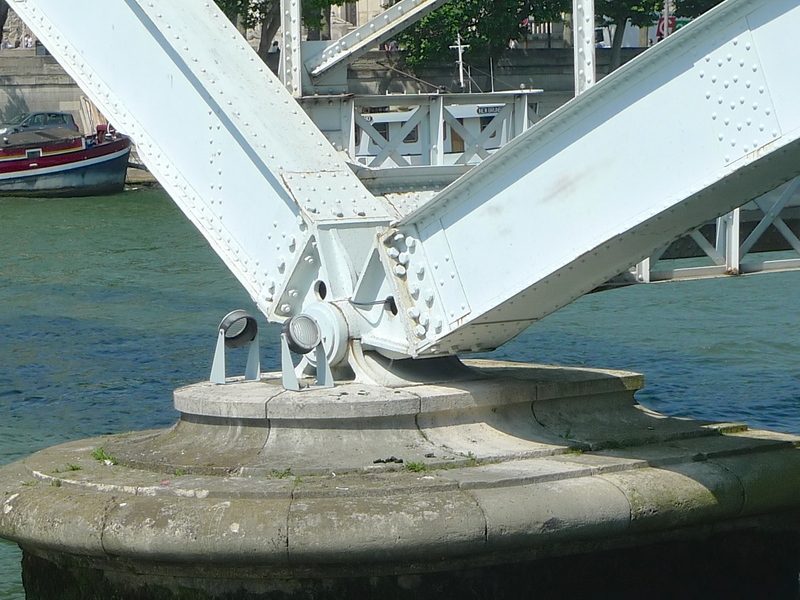 Knowing that gave me a whole new perspective on the Passerelle Debilly – The Bridge of Spies!